Pick up a Packet starting Wed, March 7, for BBQ Sunday on April 15!!! 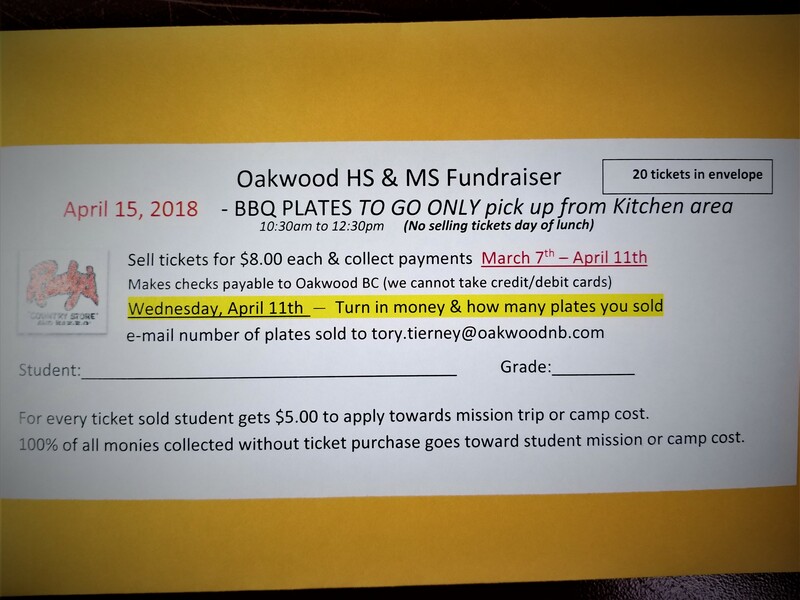 Oakwood Student Ministry Students raise funds out of each ticket to go DIRECTLY TO REGISTRATION COSTS! Our Middle School Camp is Sunday, June 3 – Friday, June 8. Middle School students will be challenged with Personal Assignment Times, Serve Opportunities in the surrounding East Texas area, Engaging Worship, and Relational Leaders that truly show the Love of Jesus. Not to mention GaGa Ball, Volley Ball, and Camp competition Games + Great CAMP FOOD Every TIME!!! Middle School Mission Trip is June 25-29. Our Mission Trip is focused on Serving Hard and Playing Hard as Middle School Students will have the opportunity to be the hands and feet of Jesus. Middle School Students have the opportunity to Intentionally Engage a community dedicated to assisting and extending a loving hand to some of the most disadvantaged children and single-mother families in our culture.